Larry and the Gang are back in 8 new episodes!" 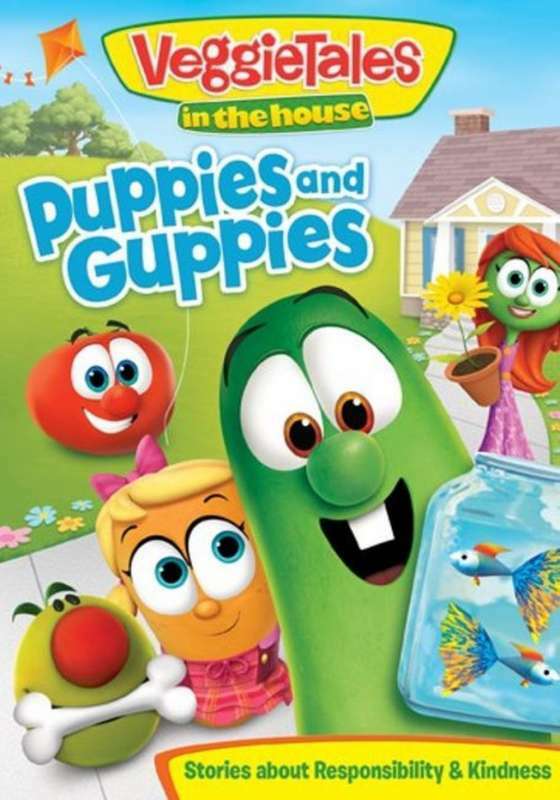 "Whoever can be trusted with guppies may one day be trusted with puppies"
Both Larry the Cucumber and Laura that Carrot want a pet each. Not just any pet, mind you. But a puppy! A real live puppy they can fun with, play with, and take on walks wherever they want. But, what they go to Pa Grapes, they are told that they might not be responsible enough to look after an excitable animal. What if, instead of getting a puppy, they stay start with something a little...smaller. A guppy! A teeny tiny fish that just swims about in it's bowl...and nothing else! In learning to look after a guppy, Larry, Laura, and any kids watching will learn that if we can be trusted with the small things, then we can be trusted with the bigger things too. That faithfulness and responsibility come hand in hand. As well as Puppies and Guppies there are 7 more adventures filled with jet-packs, popcorn, and Larry's Cardboard Thumb, and 4 fun sing-along songs. 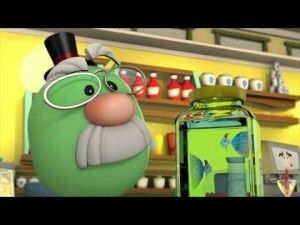 So join again with your favourite fruit and veg and learn all about Kindness and Responsibility, all about Puppies and Guppies! 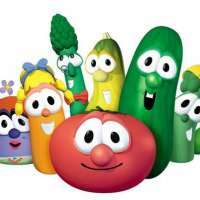 So we embark on a new series of adventures with Bob and Larry and the other ensemble cast of vegetables and fruits in Vegetales: In The House. The set- up is a little different to what we have been used to. There is the veggie town inside a house, the Veggies all live here. When I watched this with my 6 year old step-son I think it initially confused him. This strange set-up though is quickly accepted as normal for the show and as there are a number of stories on this disc you soon know what to expect. Pa Grape is now the owner of the local store and dispenser of wisdom (and guppies) and we have a new character called Ichabeezer who is the sometimes good, sometimes bad replacement for Mr Nezzer. Junior Asparagus is also back as is Laura Carrot, a character who seems to have a lot more high-profile role than in the other series. 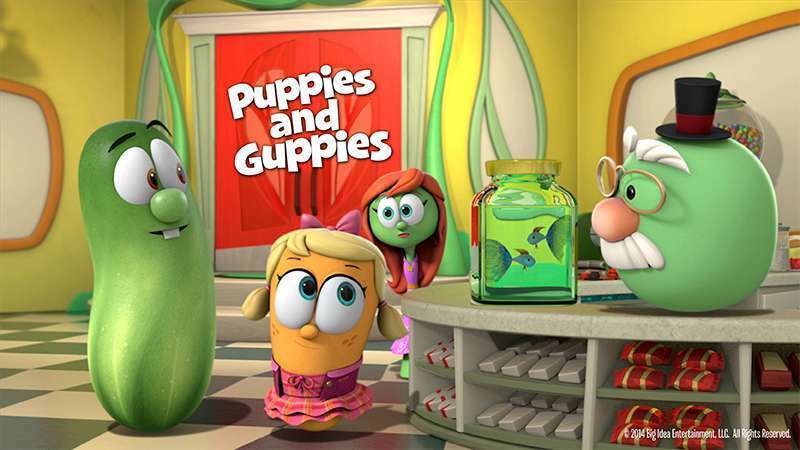 The title episode Puppies and Guppies is a good introduction to the series seeing both Larry and Laura want a puppy like Ichabeezer's dog Rooney (he's an olive dog!) They know that they can get one for "free to a good home" but Petunia Rhubarb reminds them of the cost of pet accessories that they would need. So Pa Grape agrees to let them work in his shop and he will make sure they have the money they need if they can do their jobs, but also help him look after his fish. As I said there are a number of different episodes on this disc and they are fairly fast moving. I don't think that the scripts are of the quality of the older ones. Who can forget the French peas in Josh and the Big Wall in their Monty Python homage? There is definitely nothing as memorable here in any of the episodes. The songs too seem to lack a certain something, they seem a bit out of place in the whole make-up of the show and put there because they are expected. Within the stories previously there have been classic songs and I am sure any Veggietales fan reading this will have their favourites. From the opening sequence onwards they are fun enough but instantly forgettable. Then of course there is the Biblical content. It's there, and the moral values but the emphasis seems more on the fun and less on the lesson. There are a couple of Bible verses and references to what God wants, but it feels more abstract than it used to be. Regardless of this it's still got a brilliant message, it's just not quite such a feature as it has been in the past. Fans of Veggietales will be glad to know that Larryboy does make an appearance, although I hope they don't over-use this.. As a story-telling tool it worked very well for a grand story - it doesn't function quite so well here in this cut-down style. This series has been developed between Big Idea and Dreamworks for Netflix primarily. As a watch and forget cartoon with a positive moral message I think this will work brilliantly, but it's just that - forgettable. I watched the whole 88 minute run-time of these stories and I remember very little of the individual stories. With the old episodes they really were a great teaching tool at home and at church to educate children on the big Bible stories. Clearly they are trying to expand the market for this programme and appeal to a wider audience. As I have said it's good clean fun and looks as up-to-date as any of the modern cartoons of this style that you would find on Cartoon Network, but I have a feeling that it has lost it's edge and in order to appeal has become one of many similar cartoons, albeit with a positive moral message.